The Asset Activities screen displays a list of activities used to measure an asset. On this screen, you can create, edit and delete asset activities. Asset activities are different options for tracking-meter readings and personnel usages, such as “Mileage” or “Utilization Hours”. These records are kept for each asset and are tracked through multiple windows across the application, such as Usage Log, Maintenance Log, and Failure Log. They are especially useful for the creation and updating of recurring work orders. Internal Only – if the activity should appear only on internal-type Work Orders. Billable – if the time put towards this activity should be charged to the customer. Inactive – if the activity should not be used at the moment. 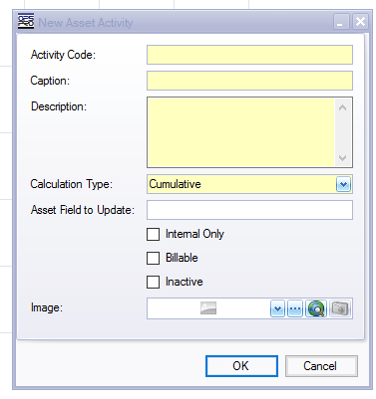 To create a new asset activity, press Ctrl+N or right-click within the grid and select New from the menu. All yellow fields in the window are required information, while white fields are optional. Activity Code – A short specification using an internal code. Caption – A longer, natural language label, to use in column headers and drop-down lists. Description – A detailed explanation, clarifying exactly what should be measured by the activity. Calculation Type – When setting a recurring Work Order for implementing asset maintenance by activity usage interval, the calculation will either work cumulatively (by default), based on the lifetime of the asset (i.e., “this truck has 3,000 miles since its last inspection, initiate Work Order”), or by the value of the last Work Order in which it was used (i.e., “this truck had 500 miles in its last job, initiate Work Order”). Image – Add an image to associate with the activity.